If you think festival season is over, we have news for you. A new festival season is always around the corner in India and, with it, a new season of giving and receiving gifts. Soon, you will have to think of unique gift ideas for Navratri, Eid, Onam and many more festivals. The traditional mithai boxes seem boring now, don’t they? One more mithai ka dabba among several others will never stand out. So, why don’t you do something unique? Instead of gifting heavy Indian mithai for the next festival, give these lighter, baked goods. Not only will your gift stand out, it will be much appreciated by all age groups. Here are seven Indian festivals during which you can do away with the heavy sweets and replace them with delicious baked items. A time of fasting and prayer for Hindus across the world, the Navratri season ends with massive celebrations and feasting. If you’re lost for gift ideas for Navratri, we suggest gifting assorted chocolates instead of traditional mithai. A hamper of assorted chocolates makes for a great Navratri gift, especially when the fasting ends and the feasting begins. Baisakhi, or the beginning of the Sikh new year, is a major festival in north India. This harvest festival is also celebrated by farmers across the country, under varying names. The festival is traditionally marked by bright colours, lots of dancing, and happy vibes. If you’re invited to a Baisakhi party, you should take something which represents these characteristics. Instead of taking a box of mithai, try a box of assorted cookies. Make a box of chocolate cookies, coffee brownie cookies, marble cookies, mini French hearts, and more. For an Indian touch, add jeera cookies as well. So much better than plain old laddoos. Even though Ramzan is a time to fast for Muslims, the Iftar parties and dinners are unmissable. And if you’re invited to an Iftar party or Eid festivities this year, you can’t go empty-handed. Sevaiyaan, the quintessential Eid dessert, can be tough to master for a newbie. And it is a bit of a pain for those who are short on time. Instead of taking sevaiyaan to a dinner party, replace it with a large assortment of light pastries and cakes. Savour a delicious spread with your loved ones and enjoy the community spirit of Eid. A time to celebrate the bond between brothers and sisters, Raksha Bandhan is also a time to indulge in sweets. On a day when most siblings are really nice to each other, you should celebrate with something special. While most families will have the traditional Indian sweets, you can take scrumptious brownies as a gift for your siblings. Well-made brownies are not too sweet or heavy, unlike Indian mithai. A traditional festival of Kerala, Onam is celebrated with much fervour (and food) among Malayalis. One of the most common Onam desserts is payasam. It’s absolutely delicious but it is heavy. And people who are really strict about their diets may run far away from it. It’s a delight to be invited to traditional Onam celebrations but you should take something sweet with you. After all, you are a good guest, aren’t you? We suggest that you replace the heavy, traditional payasam with banana walnut cake. It’s sweet, has a wonderful banana flavour which plays a large part in Malayali cuisine, and is easy on the stomach. One of the biggest festivals among Bengalis, this festival is celebrated with a range of sweets. But the main stars are rasagulla and sandesh. Every household will have either or both of these to serve to their guests. So, when you go to someone’s house to celebrate with them, it’s pointless to take more of what they already have. Instead, surprise them with an assortment of tasty treats like almond and lemon tarts. Tarts are light, flavourful, and not too sweet. They’re also not messy to eat, unlike most Indian sweets. Diwali, one of the biggest festivals in India, is when everyone loses track of their healthy diets and fitness resolutions. You won’t be doing anyone a favour by, once again, gifting a huge box of assorted mithai. Replace that box with an interesting and scrumptious breakfast hamper. Choose the finest breads, baked items like croissants and muffins, and healthy cookies for your loved ones. Show them that you really care about them. 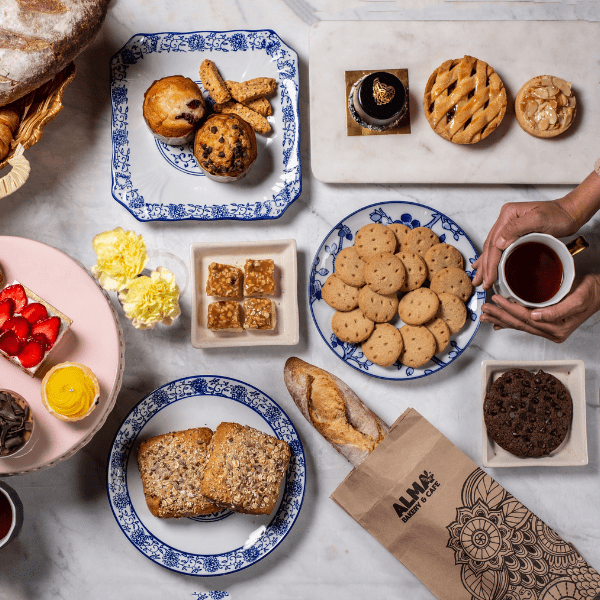 You can get this assorted breakfast hamper and all of the other tempting baked goodies mentioned above at Alma Bakery & Cafe in Sector 104, Noida. Head over there for the most unique gift ideas for Navratri and all the other festivals coming up this year.